Apart from having a passing childhood imagining that maybe I would grow up to be a chef, I would never have thought of jotting down a recipe like this. 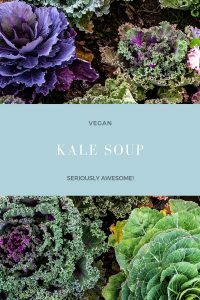 I don’t think I even considered cooking with kale till a few years ago, when a friend suggested the health benefits of kale and combining these ingredients to come up with this easy kale recipe. As someone interested in a healthy body to support my meditation, energy healing and spiritual practices, a range of kale dishes have now crept onto the regular dinner menu – healthy, easy, fast and nutritious. Thank you to my gifted and inspired friend Annapūrṇa for suggesting this combination of ingredients. And finally if you’re interested in a high quality awesome blender that blitzs this soup in less than a minute, you might consider a Vitamix. I’ve had one for years, and I totally love it. I’m a reseller, so drop me a line if you’re in Australia and are interested in getting one for yourself. There are a range of models, colours and prices.